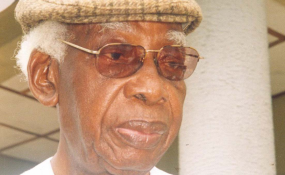 Yenagoa — President Muhammadu Buhari, former President Goodluck Jonathan and Bayelsa State Governor, Seriake Dickson have expressed sadness over the passage of the renowned poet, novelist and playwright, Gabriel Okara, aged 97. This is coming as the state government yesterday declared a three-day mourning in honour of renowned literary icon, Okara. In a statement issued yesterday by his Special Adviser on Media and Publicity, Mr. Femi Adesina, in Abuja, the president extended his condolences to the Okara family. President Buhari also condoled with the government and people of Bayelsa, the literary community and all who drank from the writer's fountain of knowledge. The president believed that Okara, who was deservedly known as the "founder of Modern African literature" would be fondly remembered for his immense contributions to the development of African literature, drawing on experience from his native Ijaw language. The president extolled the "great story-teller whose powerful use of imagery and symbolism in his literary writings helped the world to appreciate and understand the richness, complexities and uniqueness of the African heritage and culture." On his part, former President Jonathan has condoled with the Okara family, the Bayelsa State Government as well as the literary world over the demise of the foremost poet and novelist. In a message of condolence he personally signed, Jonathan described the exit of the literary giant as a colossal loss to the Ijaw nation, the country and the African literary community. In a statement, which was released by Mr. Ikechukwu Eze, his media adviser, the former President extolled Okara as a great man of arts and wit, whose legacies permeated the field of humanities and statesmanship. It said: "The death of a loved one, no matter his age, brings grief to our heart and tears in our eyes, but we must take solace in the fact that Pa. Okara lived a long and glorious life. "He was a pioneer voice in modern African literature, a consummate journalist, a seasoned administrator and a statesman who lived a life worthy of emulation." Dr. Jonathan also prayed that God will continue to bless members of the Okara family, and grant them the fortitude to bear his exit." Okara, who is from Boumadi, Bayelsa State, died at the Federal Medical Centre, Yenagoa, in the evening of Sunday, March 24, 2019. It was gathered that the legendary poet and novelist died at the age of 97, approximately a month to his 98th birthday. The Association of Nigerian Authors, Bayelsa State chapter, in a statement by its chairman, Mrs. Bina Ilagha, said, "The association is ruffled by the news because it came at a time when preparations were in top gear to celebrate his masterpiece, The Voice, at 55. "We are saddened by the news, but are consoled that he left behind lofty legacies. "Pa Okara, through his literary exploits, put Bayelsa on the map of literary excellence." Meanwhile, Dickson has described Okara's death as a great loss to the state and Nigeria. He stated that as a mark of honour, his government has declared a three days of mourning for the late Okara begining from yesterday to next tomorrow (Wednesday) with all flags to fly at half mast. The Commissioner for Information and Orientation, Daniel Iworiso-Markson quoted the governor to have made the remark in a statement issued yesterday. He said Okara who passed on at the age of 97 made a remarkable mark in the African literary industry, churning out great works that helped shaped the African society which include, The Call of the River Nun, the Fisherman's Invocation, Piano and Drums, You Laughed and Laughed and Laughed and others. The governor who said that Okara was held in high esteem as a pride to the Niger Delta and indeed the African contingent added that that it was in appreciation of his exploits that the government decided to name the State Cultural Centre in Yenagoa after him.